Nick Williams, Roman Quinn, and Dylan Cozens played in the same outfield for the first time on Thursday. It'll become a regular thing for the prospect trio in Allentown come April, with the big leagues on phone call away. CLEARWATER, Fla. – After J.P. Crawford, the top prospect in a lineup full of prospects, took first base on a four-pitch walk, Dylan Cozens unleashed a violent swing that sent a baseball onto the lawn area behind the center field fence at Spectrum Field. Cozens, an outfielder built like an NFL tight end who hit a minor league-best 40 home runs last season, launched a two-run home run in the Phillies first exhibition game on Thursday. “The ball makes a different sound coming off his bat,” manager Pete Mackanin said. It’s equally fun to watch Roman Quinn, when he also hits a home run (a blistering line drive over the right field fence), steals a base, and makes a diving catch in center field in the span of the game’s first three innings. Quinn, Cozens, and Williams, a trio of the Phillies' top 10 prospects, started in the same outfield on Thursday in Clearwater. Even as they've all progressed in the Phils' minor league system in the last two years, they never shared the same field (except for the two Futures Games held last year in Philadelphia and Reading). On Thursday, they combined for four hits and a walk in the Phillies exhibition win over the University of Tampa. In another six weeks, Quinn, Cozens, and Williams will be patrolling the outfield in Allentown and hitting in the prospect-filled lineup of the Triple-A Lehigh Valley IronPigs. For the better part of the last half-decade, the Phillies have had a dearth of outfield options. They struck a bit of gold with Odubel Herrera in the Rule 5 Draft, but have otherwise had to plug guys like Peter Bourjos, Tony Gwynn Jr., Jeff Francoeur, Cedric Hunter, and Delmon Young into their regular lineup. Entering 2017, the Phillies have a proven All-Star in center field in Herrera and an elite prospect in 2016 No.1 overall pick Mickey Moniak slated to start in Low-A. In Quinn, Cozens, and Williams, they have a trio of others on the brink of taking their considerable talents off the pages of the annual prospect rankings and into Citizens Bank Park. “What makes it even more exciting is we all came up through the farm system together, and to be right on the doorstep is pretty exciting,” Quinn said. “We have great team chemistry, all get along. And that’s (not always easy) with a big locker room of guys, with everyone getting along. But we all truly get along. Perhaps it's fitting that Quinn, known for his Michael Bourn-level speed, beat both Williams and Cozens to the big leagues. The 23-year-old former second round pick played in 15 games with the Phillies last September. With veterans Michael Saunders and Howie Kendrick brought in this winter (but as one-year stopgaps at most, and very likely July trade deadline bait), Quinn is slated to play at Triple-A for the first time in his career. Quinn, who has failed to play in more than 88 games in any season since being drafted in 2012, has been in Clearwater since November putting the work in to enhance his durability in 2017. There might not be a fool-proof way to prevent injury, but Quinn is certainly trying. If staying healthy is Quinn’s best path to a regular role in the Phillies lineup, Williams’ hurdle is having a more consistent, disciplined approach on offense. The 23-year-old’s struggles in his first full season in the Phillies system have been well documented and he’s been working with new hitting coach Matt Stairs since before camp opened in Clearwater. Even though he did not hit a home run like Cozens and Quinn on Thursday, he did collect a walk (which was a rarity last summer) and he also scolded the ball twice with line drives that found outfielder’s gloves. “I feel like I didn’t even swing,” Williams told Stairs in the middle of the game. Stairs had Williams cut down his leg kick in an effort to keep his head steadier and get a longer look at incoming pitches. Roman Quinn just hit a line-drive home run. He also has a stolen base, a single, and a diving catch in CF today. Coming off a breakout season in Double-A, Cozens will have to prove he can have success against more seasoned pitchers at Triple-A in 2017. As an imposing 6-6 figure with considerable power, Cozens will surely see a bevy of breaking balls in Allentown. None of the Phillies prospects are finished products. And they won’t be when they arrive in the major leagues, either. Like all young players, they’ll continue to endure growing pains. 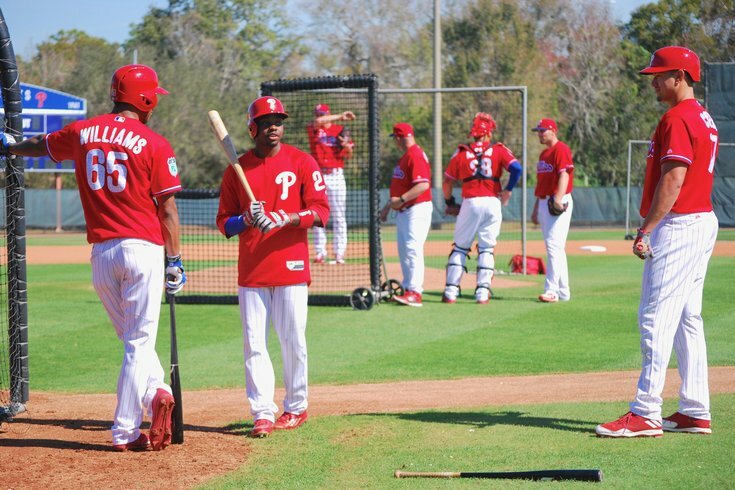 But for a good portion of the next month in Clearwater, and then in Allentown this spring, the trio of gifted outfielders will put their respective talents on display and hope to leave lasting impressions.